Aquí encontrarán noticias y las adiciones recientes a la galería./ Here you will find news and recent additions to the gallery. La Galeria de las Briofitas de México es un esfuerzo colaborativo para coordinar y promover la disponibilidad en linea de fotografias. La galeria consiste de fotos dentro de álbumes arreglados jerárquicamente. 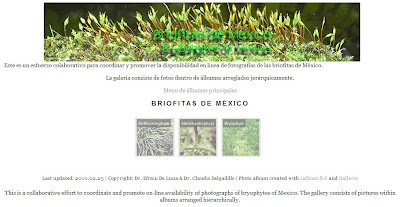 This is a collaborative effort to coordinate and promote on-line availability of photographs of bryophytes of Mexico. The gallery consists of pictures within albums arranged hierarchically. We have configured a hosting service to build an on-line central reference system for photographs of the bryophytes of Mexico. The goal is to provide a catalog based on a taxonomic classification system, facilitate image search and broadcast on-line, contributing to popularize knowledge about the bryophytes of Mexico. This is a collaborative initiative by Dr. Efrain de Luna (INECOL) and Dr. Claudio Delgadillo (UNAM). The catalog of photos is built as an "album" within an "album" following the taxonomic hierarchy of a particular group. Image search is facilitated by the generation of RSS feeds configurable by the user and a subscription service to the aggregation site using "feed readers". This gallery, as a collaborative effort, intends to become a catalog of contributed pictures of the bryophytes of Mexico. Individuality some of us have already taken photographs and even have uploaded them on-line. However, under the Gallery project we would be sharing images and adding links to photos on other websites. The versatility of this gallery system is its use it as image handler (upload, display in several sizes, directory structure, etc), as a link to photos on other websites (for example IREKANI), and as a notification service for additions of pictures or links to the catalog. All registered users. The user enters the blog site with any web browser and clicks on the "Register to collaborate " link located at the upper right-hand corner of the entry web page. The "administrator" checks and authorizes your account; the user may then enter the Blogger.com system by clicking on "Add photograph(s) to the Gallery". As a registered user, you will have access to the blog system tools to add and edit "posts". Photographs are uploaded on-line using your preferred web browser (MS Explorer, Mozilla Firefox, Opera, etc). Registered users login to Blogger.com and post images by clicking on "Add photograph(s) to the Gallery". Detailed instructions can be found here. Pictures are labeled with author data, taxonomic id, etc. While adding original photos, the software automatically edits three sizes for visualization and generates thumbnails for navigation. Display of the image catalog is by a system of "Album within Album, within Album". The system generates an RSS notification every time an image or a link is added to the site. Hopefully, this service will facilitate efforts to post on-line pictures of bryophytes in a more coordinated way and will promote collaboration of everyone interested in the bryophytes of Mexico. Registration of collaborators will remain open indefinitely to all. We hope to see more photos and links incorporated as time passes. Thanks so much for your encouraging comments! Briofitas. C. Delgadillo, 2003. Sociedad Latinoamericana de Briología. Briofitas. E. De Luna, 2007. Briología en el INECOL. 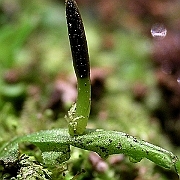 Bryophyta. Tree of life web project. Classification of the Bryophyta. 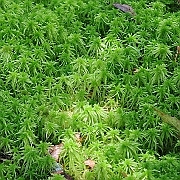 This classification of the mosses is based on Goffinet, B., W.R Buck and A.J. Shaw (2008), Morphology and classification of the Bryophyta, in Goffinet & Shaw (eds.) Bryophyte Biology 2nd edition, p. 55-138, Cambridge University Press. Classification of hornworts: website maintained by Juan Carlos Villarreal. BryoSphere. Current bryology in the cybersphere. Las fotografias en esta Galería pueden ser utilizadas para propósitos no comerciales, bajo los términos de la licencia Creative Commons. Cualquier uso de carácter comercial debería ser consultado previamente con los autores. - You are welcome to use our pictures for non-commercial purposes, with notation of the copyright owner. In case of commercial use, however, we would like to be asked. Briofitas de Mexico is licensed under a Creative Commons Attribution-Noncommercial-Share Alike 2.5 Mexico License.